One of the first things I did when most of the construction in the new abode subsided, was to set up a bar cart...Because I love to have friends over and beverages should be handy for people. There's one in the living room. The dining room has one and when duty calls, a makeshift beverage area exists in the kitchen. I feel like William Powell, Myrna Loy and Tallulah Bankhead would feel at home here and that makes me happy. Setting up a bar cart. 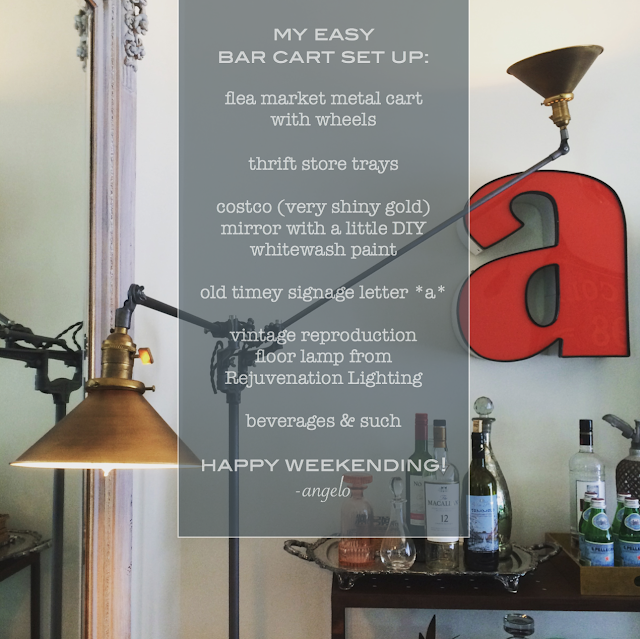 station or area couldn't be easier and it's a great place to get creative with the materials you use fashion, said bar cart. Look for interesting carts, tall rolling trays or even a vintage hutch that you can transform. Sometimes, just adding a groovy tray to the top of an old chest of drawers and propping it with the materials you need, is all it takes to make for a great entertaining corner in your home.